SIMPLE. That is what the word "Sencillo™" (pronounced SEN'-see-oh) means in the Spanish language. Everything we do at Sencillo™ is done with that in mind. When you select a Sencillo™ system, we want every aspect of doing business with us to be just that - simple. 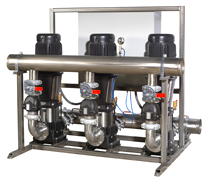 The pumps and motors are simple to replace; the controller is simple to understand and operate. 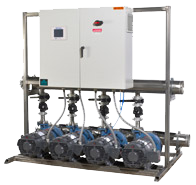 The logic for operating pumps doesn't need to be complicated to operate correctly. We do the hard work behind the scenes, so your job of selecting, purchasing, running and maintaining a Sencillo™ system can be wrapped up in one word - SIMPLE. Domestic Water for sinks, toilets, showers, drinking water. 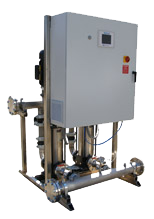 Plant water for process, washwater, cooling, utilities, general use.